After I completed the 2009 Boston Marathon (i joined Tedy's Team, I did not qualify but I didn't just write the check either... i actually raised the money! ), I wrote the thank you letter below to my friends and family who supported my efforts. While writing this letter I realized how much running has done for me. Running was not something that I talked about with my friends and I would certainly not offer up the fact that I was runner to anyone that I worked with. It was almost like my dirty little secret. I do not look like a runner and I usually don't act like a runner. At least, I don't think so. Although, I'm not really sure how a runner should act. Maybe like Ryan Hall? In fact, when I was a teenager hanging around San Francisco I remember looking at runner's and telling my friend's (with our skateboards in hand) that if I ever started running to throw me off the Golden Gate Bridge because I had clearly lost my mind. I figured this letter would be a good first posting on the undefeated running blog. I want to thank you for helping me reach my goal of raising $3000 for the American Association. Tedy's Team raised a total of $250,000.00 for stroke research!!! Meeting stroke survivors on our marathon team and learning about other runner's experiences with stroke in their lives was inspirational. I am more grateful than ever that I am able to line up on the starting line of a marathon or able to go for a run... or just a walk down the street. Don't take your health for granted! 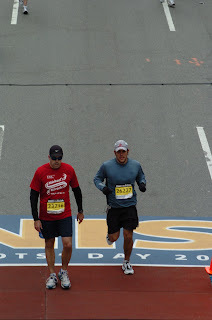 Running the Boston Marathon was an incredible experience. The history that surrounds the race and the support of the people lining the course is awesome. I completed the marathon is 4 hrs and 29 mins (1st half 2:03; 2nd half 2:26; i was planning on running a negative split!)... more than a half hour slower than I wanted which was a similar sentiment to many of the runners I spoke with after the race. All of us agreed it must have had something to do with the strong headwinds and cold temperature. Although, after digesting the whole experience I realized that those conditions made it an even better experience for me. You're not always going to go out and have perfect conditions to run in as you might not always have perfect health conditions to live with. Human nature comes with two amazing elements though; perseverance and resilience. We are born with these elements and they can be made stronger by training but they reach their full potential with the support of the people around you. During the race I thought about all of you who supported me in this endeavor and it truly helped to keep me going at some of the most challenging times. I was running up over the top of Heartbreak Hill (at about mile 21) and was hit with a headwind so strong that I thought my lower abdomnials tore. I really thought I needed to stop running. I walked thru the next water station to regroup. I looked around at the crowds that were about 5 people deep (and continued to get deeper on both sides of the course through the finish line) and then I thought about all of the people that were supporting me in this run. Even though my lower ab's were still cramping I started running again. Turning onto Boylston street and seeing the Boston Marathon Finish line a quarter mile away was unreal. There is a picture attached of me crossing the finish line.